I will be at New Orleans Comic Con on Saturday January 29th only. Tonight and early tomorrow morning, you Western hemisphere folks (which includes me) can see a lunar eclipse. At about 12:30 a.m., the big event happens but we won't be able to see anything (provided the sky is clear) until after 1:00 a.m. There will be a smudge on the upper-left part of the moon. Here's a full article about it. And here's a link to NASA's lunar chart (but they've been v., v. busy today so be patient) or here's the pic of the site in case it's too busy. I hope you are up that late because the next time you'd be able to see it is in 2014. Here's a news article about it. And a picture from 2003 is included. UPDATE: Here's a video of what you missed. From time-to-time, I see science news that just has to be shared. A lot of the time, it doesn't necessarily have to do with Jupiter or even this solar system. But I am always happy to promote (through linkspam) the exploration of space as a whole in the hopes that it will make that much more plausible my own theories of and hopes for space exploration. First, Voyager I, on the road for more than 30 years and still doing business. Going where, literally, no human has ever gone before. Second, every year this guy does a "best of" space pictures. This years list is a wicked cool (and pardon the pun) out-of-this-world show. You don't want to miss it. As many of you know, I wrote a book called "Europa" and the story is based entirely on Jupiter's moon Europa. 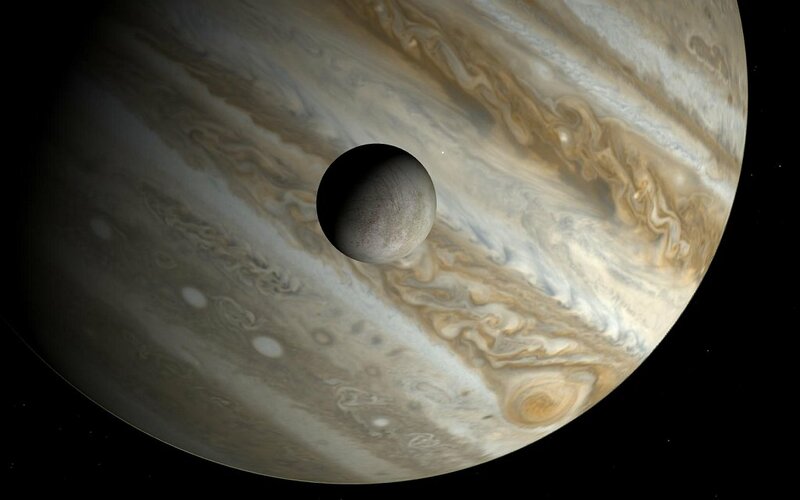 NASA is sending a probe next year that should reach Jupiter/Europa roughly 10 years after that. But most likely it was a slight shadow or blur just on the east horizon. Someday we'll get pictures which are closer ... and dare I say more accurate? If you want more information about this story (and the whole timeline) visit this website. My wife sometimes reviews shows and movies for a blog and she was able to do a short synposis/review of Europa. (She loves the book, of course.) 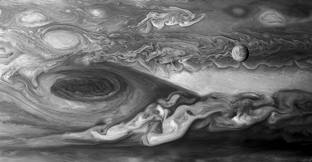 And in the interest of selfless promotion, and if you're primarily interested in getting a short synopsis of Europa, please visit the blog post here. And in the interest of share and share alike, if you're a movie buff like me, go ahead and visit this site on a regular basis. They post between 3 and 8 reviews of a variety of different media per week. Thanks for letting me share and let me know what you think!